← Day 25 – “Gentlemen.. START YOUR ENGINES” we are donnnnnnnnnnnneeeeeee! Made it to the track OK— sorry no photos yet at the track (been working on 30mins of sleep here 🙂 ) more tomorrow I promise and a video or two if I can show my Dad how to use my camera 😉 — hoping to have my “Go-Pro” working so I can post an HD incar video of her first time out. Thanks guys for all the support and kind words, couldn’t do it without you! Some photos below of us last night (~3:330am or so!) corner weighting the car. She is a heavy one! 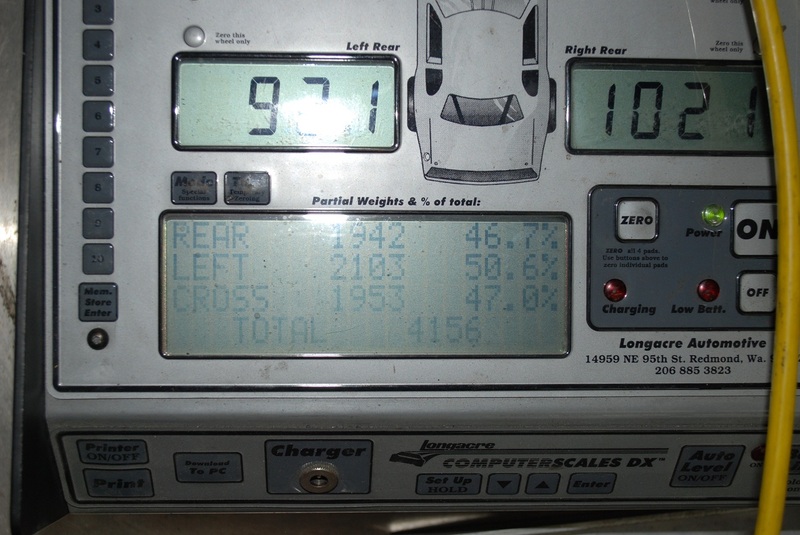 4156lbs without driver and dry (no gas)! Should be close to 4400 with me and gas!